An airline approved cat carrier is a must when traveling with your cat by air. Do pet carriers must meet certain specifications? How do you choose the right carrier? Where can you find it? Don't know where to start? Rest assured. The following information will give you several pointers to help you select an airline approved cat carrier. Many cat owners travel with their cats. Relocation is the most common reason for cat travel. However, many people also take their pets on pleasure trips. And, due to its convenience, a lot of people prefer to travel by air. Fortunately, cats - and other small animals - are now allowed in the passenger cabin. Not all airlines allow pets. However, many of them do. Always consult the airline to find out all the requirements before you buy your ticket. If your airline does allow pets, you must follow their guidelines regarding pet carriers. For example, an airline cat carrier should fit underneath a seat. But just because your cat carrier is small enough doesn't mean that it is airline approved. Another important factor of airline pet travel is that many airlines require a health certificate from a veterinarian. Make sure you get all the paperwork in advance so that you don’t have any delays. So what other specifications are required in a pet carrier? Be well-secured so that the pet cannot escape. Comply with size requirements. Keep in mind that acceptable pet carrier sizes vary slightly per airline. For example, US Airways accepts hard carriers up to 17 inches long, 16 inches wide, and 8 inches tall. Soft-sided carriers can reach up to 17 inches long, be 16 inches wide, and 10 inches tall. American Airlines accepts pet carriers that are 19 inches long, 13 inches wide, and 9 inches high. Have enough ventilation. Some airlines require that the cat carrier should have ventilation on at least two sides. Allow pets to comfortably move inside the carrier. Most airlines accept both hard and soft-sided pet carriers. Some airlines also accept larger kennels. Check with your airline before hand for their kennel requirements. As stated above, the pet carrier should be "escape-proof". Airlines do not allow pets outside of their carriers. Keep in mind that most airline carriers allow only one pet per carrier. Also, with very few exceptions, they allow only one pet per passenger. 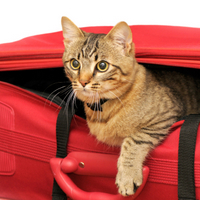 Most airlines count a pet carrier as a carry-on bag. You may have to pay a fee to travel with your pet. Contact your airline for details. Since most airlines do not allow pets outside the carrier, you must securely attach a water/food bowl inside the carrier/kennel. Select an airline cat carrier that is comfortable and easy for you to carry. Many soft-sided cat carriers have adjustable, padded shoulder straps. Confirm with your airline that you will be traveling with your cat at least 24-48 hours before your flight. Get to the airport with enough time. That way you don't have to rush through check in and security. It is a good idea to bring extra cat food, treats, water, and litter in case there are delays in boarding the plane. Need help selecting an airline approved pet carrier? Here are a few airline approved pet carriers you may want to consider. You will find both soft-sided and hard-sided airline pet carriers. These items are brought to you in affiliation with Amazon.com. Buying an airline approved cat carrier is a good investment, especially if you travel frequently. 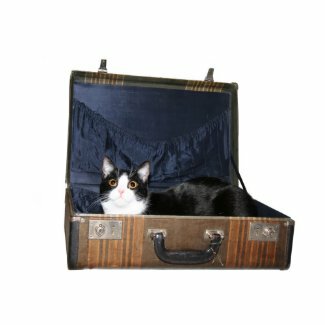 But even if you don't travel often, you will still need a carrier to transport your cat whether it is to go to the vet or to another location. And the good news is that you can use the airline pet carrier for car and rail travel as well. Traveling with pets is not easy. The logistics of it may be too daunting for many pet owners. Fortunately, pet travel kits may make the whole experience much more manageable. The Petmate airline travel kit is perfect for pet owners: It includes food and water bowls, identification tags, pet sticker for your luggage, and absorbent pads. You will certainly have everything you need to feed your kitty and clean up any messes in no time. You will also find travel kits that come with pouches to carry your cat's food and other essentials. They keep these items neat and organized: you will always know where everything is. The Petrageous Designs kit offers a great option. Indeed, their travel kit will help you keep everything tidy and organized. It includes a goody bag (to keep those delicious cat treats handy) and a bowl. With this convenient pet travel set, you have everything you need to take care of your kitty - even when you're away from home. Now that you have chosen an airline approved cat carrier, it's time to go places with kitty!